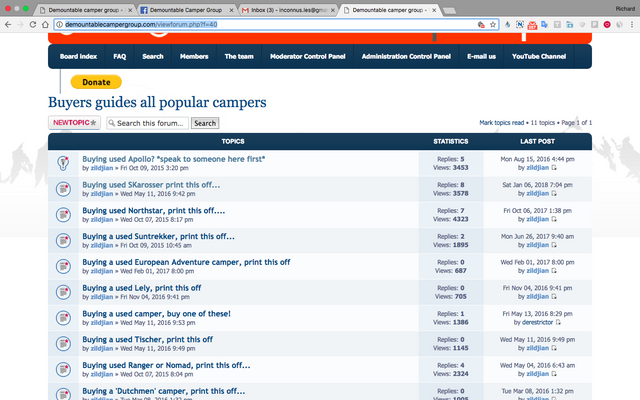 I have been a member of the forum for a while but am finally in a position to buy a truck and camper. I have two main questions, firstly I have read a lot of advice on this forum about upgrade suspension but I cant work out if it is a necessity or just beneficial? Outside of using the truck for the demountable it wouldn’t but worked and only used for a short commute. Secondly, as I do not currently have a truck would you advise to hold off and see if you could buy the both together or get either the truck/camperfirst? My intention is probably to spend more on the camper and less on the truck as it can easily be changed later, and my only criteria is a toilet/shower and not a pop top as we would use it often in the winter. Last edited by tomc on May 7th, 2018, 4:24 pm, edited 1 time in total. Hi Tom & welcome to the group. I would recommend buying a truck 1st & getting the airbags & fixing points done before you buy a camper. This would then enable you to pounce on a camper at your leisure. The airbag suspension is a definite must, especially if your planning on running a double cab truck. This will help to level the load by assisting the rear suspension. When you use the truck for day to day use, you'll let the airbags down to approx. 5psi & also reduce the tyre psi accordingly. This should help to soften the ride a bit & not bounce you off the road. 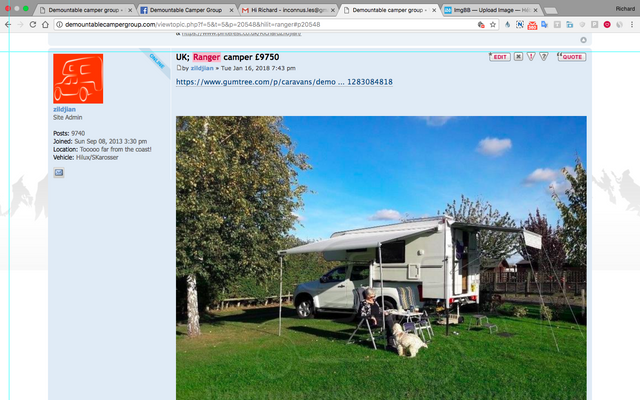 in terms of finding a camper you've been here long enough now to see there aren't nearly as many used campers in UK as Europe, but more usually they are sold together (though Left hand drive) which isn't convenient to everyone. Thank you both for your advice, could either of you give a ball park figure of getting air suspension installed on a truck if it is a must have as this would impact my overall budget as I have no idea of price? Also its well known that Nissan‘s have some chassis issue but what is the experience from the group as to the best trucks for the job and equally the ones to avoid? other than that many members own Ford Ranger and experience few problems. Obviously there are three Pick up truck type's. Double cab, Extended/Super cab & Single cab. How many people are going to be using your De-mountable? 1/2 or 3 to 5. As good a place to start when choosing which pick up, as all three have a different amount of belted seats. I have owned pick up's from Ford, Mitsubishi, Mazda, Nissan & Isuzu. I know people have Favorouite makes, i really rate Isuzu but as there are a variety of different combination's of truck & De-mountable owner's in this group i would suggest that it's more what suits your budget & you have noted a truck can be changed. If you do buy a pick up by itself i would suggest getting exact measurements between wheelarches , if it has a ladder rack, can it be removed ? Also, most owners remove the tailgate, saving 20-30kg of dead carried weight, can be an issue & by doing so you get the right overhang at the back. Don't get caught up buying the wrong length of De-mountable camper, it must be matched to the bed length of the truck. I'm sure there are plenty of photo's on here of too much mis matching! NISSAN NAVARA D40 - I know from owning a Kingcab that some have possible weak/Snapped chassis's. After four years i sold mine BUT i know of two Members on the Forum who had their's modified/Strengthened successfully. Thanks for that ,there is a lot of useful advice here. Firstly im glad to see the suspension is an affordable option so will definatly be going for it. As far as trucks i have decided to wait and watch the market a little bit to see if buying the pair together here in the UK is an option, if not I will be leaning towards Isuzu and Toyota and look at nipping across the pond to bring one back as I dont want to import a left hand drive truck. But if there is any truck about for a good price I think its worth considering as I’ve heard good feedback about most really. As far as the split if I’m buying separately I think I will still look at spending slightly over half on the camper and a bit less on the truck as there are good higher mileage examples for that and as said they are easy to replace. But who knows what will come up from what I’ve seen the most important thing is to be able to react quickly when you find the one you want. Thanks for that, I’ve just been looking online and seen that a show called Adventure Overland is running this weekend not too far away from me. I could go this afternoon does anybody know if there is much to see in the way of demountables? I would only be a flying visit as it shuts at 16.00 but might be worth going for a look.